The U.S. Navy is unmatched, but not invulnerable. The fleet has been shrinking, stressing the force as sparkling new Chinese warships sail from the shipyards at a brisk pace. 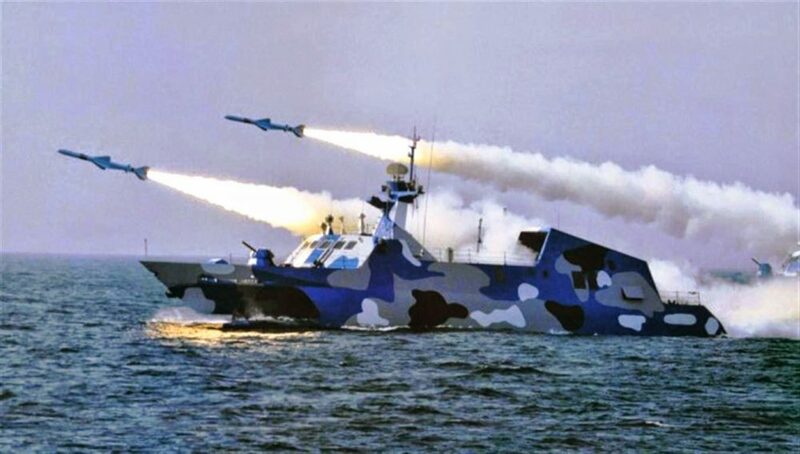 A more worrying problem is that American warships are outranged—often by large margins—by anti-ship missiles, such as those also in service with the Chinese navy. Growing the fleet is not so easy, either. A naval expansion takes years of planning, construction, trials and a great deal of resources. Though the Navy is now getting a boost in numbers, it’s a modest increase compared to what U.S. Pres. Donald Trump called for during his 2016 campaign. The expansion will not be as large as many admirals and naval analysts would like. Further, the Navy doesn’t just need more ships, it needs more combat ships capable of specifically taking on enemy vessels in battle. The Navy currently has 277 of these “battle force” ships. It also needs longer-range missiles, which the Navy is developing, as they remain the preeminent weapon for surface ships. Cannons are relatively short range and of secondary utility—and futuristic railguns and laser weapons are still too experimental to take over. That’s the background of a June 2017 article in Proceedings by retired U.S. Navy Capt. Robert Rubel, the former dean at the Center for Naval Warfare Studies. For instance, Congress’ requests for forward-looking plans from the Navy are heavily based around specific types of ships such as frigates, destroyers, cruisers and so on. These ships, which are expensive and time-consuming investments, keep the size of the Navy smaller than it needs to be. The Navy also needs missiles in quantity as well as quality. But missile launchers, unlike the battleship guns of the past, “can be placed on almost any kind of ship,” Rubel writes. It’s hardly a radical idea, and navies around the world have found similar ways to get creative. Smaller navies such as Iran’s can pack a punch with cheap, small missile boats that “swarm,” piranha-like, around a larger destroyer, which can’t defeat them all. To compound the U.S. Navy’s problems, America’s anti-ship Harpoon missiles fire from vertical launch systems which cannot be reloaded at sea. In a large-scale naval clash, U.S. warships may quickly deplete their missile stocks, forcing them to return to port. Rubel suggests an alternative—ready-to-go missile containers that can go practically anywhere. The Navy could even plop them down on islands, which have always played an important role in shaping the contours of naval campaigns. These drop-in, pop-up launchers have appeared sporadically. Russia has developed a version of the Club-K anti-ship missile—which has a greater range than the Harpoon—with the launchers camouflaged inside a shipping container. Rubel argues that the Navy should adopt a similar practice by adding container launchers to ships, and having helicopters fly fresh containers after they run dry. It’s faster than sending the ship back to port to rearm, thereby allowing a fleet to keep up the volume of missiles—while presenting more foes for an enemy to deal with. “Such a capability not only would distribute combat power—complicating enemy targeting and permitting graceful force degradation—but also would simplify combat logistics,” Rubel writes. In short, a Navy doesn’t strictly need every combatant to be a purpose-built fighting ship. It needs to outgun an enemy at long range—and it needs the sensors and reconnaissance assets to detect them. Finally, the warships in combat need to be networked, as being able to see an enemy, and communicate where the enemy is to friendly vessels, will be key to determining the outcome of a battle. Regardless, navies should anticipate that enormous numbers of missiles will be fired in a future naval war, with the goal of overwhelming a foe’s defenses. It’s all the more likely because the U.S. Navy will continue to have an outsized advantage in carrier-launched aircraft, emboldening China and Russia to double down on missiles—and use them in surprising ways.